Screenshots have leaked of what seems to be the upcoming Google Music store as seen on an HTC Inspire 4G. Google sent out journalist invites to an event taking place 16 November late last week with the tag: "These go to eleven" – prompting warranted speculation that it is about to release its Google Music store, which will turn its cloud-storage service into an iTunes rival. The screenshots that have turned up on blog TecnoDroidVe certainly look legit and show off a number of features that users should expect from the music service. The first is a 'free song of the day' feature which, as the name implies, will offer up daily freebies to users. There's also a recommendation page, where you can information on artists that are similar to who you have been listening to and there's search functionality and a sneak peak at how much a song will cost. 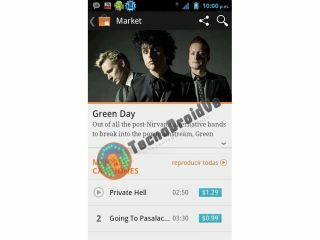 A screenshot of Green Day shows that one track 'Private Hell' will set you back $1.29 but Going To Pasalacqua costs $0.99. It's pretty clear that Google is going to offer up some sort of information on its Google Music store and if these screenshots are indeed the real deal, then this could well be one exciting service. Unfortunately for the UK, it is unlikely we are going to get any information as to when Google Music will be coming to these shores. The screenshots look real, so we are pitching this rumour as Very Likely.